Following the success of Cloak and Dagger (which has already been renewed for a second season) on Freeform, Marvel will broadcast the first episode of their previously-Hulu-exclusive Runaways on the network. Deadline is reporting that, starting August 2, the premiere episode of Runaways will be airing on Freeform right after Cloak and Dagger‘s season finale. As of now, it’s not clear if the entire first season will air on the network, but giving a lesser-known Marvel franchise a spotlight like this will allow a greater audience to be exposed to the series. The decision to air the pilot episode on Freeform represents part of the ongoing partnership between that channel and Hulu. 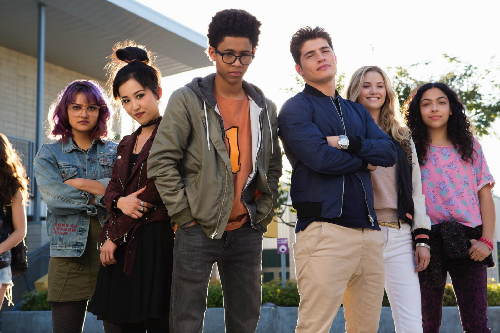 The plot of Runaways involves a group of childhood friends with gifted abilities (some with actual superpowers, others with super-smarts) growing to be teenagers in a world where superheroes exist. While none of them expected to be heroes themselves, the six teens ultimately unite to stop a very personal threat: their own parents, who are members of a dangerous criminal organization known as the Pride who operate as a cult to forward some mysterious agenda. Runaways Season 1 can be watched in its entirety on Hulu, but people who don’t have that service can check out the premiere on Freeform this Thursday. A thirteen-episode Season 2 has been ordered.